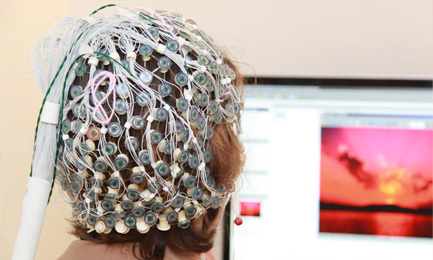 Electroencephalography (EEG) enables the tracking of the time course of brain processes at millisecond temporal resolution. The Spinoza Centre has an MRI-compatible 256-channel EEG system available for recording EEG either in isolation or during MRI scanning. The combination of MRI and EEG offers mutual benefits, including the linking of single events between the MRI and EEG signals, and better localization of the source of the EEG signal.